Living Life by Design - with Alan and Mark: Saving a Moose! Talk about being in the right place, at the right time! 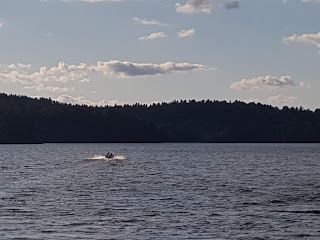 We had just been out wild berry picking, and had arranged to drop in to see our friends, Julie and Chris, who have a trailer campsite on South Bay, Dunlop Lake, just north of town. 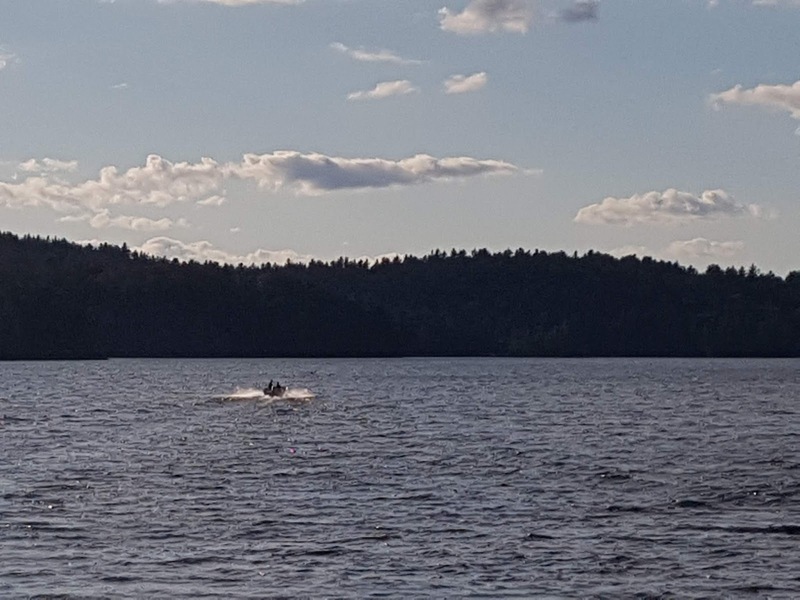 We decided to sit overlooking the lake and were fussing the dogs, and shooting the breeze when, out of the blue, Mark shouted out, 'Look, there's a moose swimming by!' We estimated that it was a young calf, possibly about a year old. We couldn't believe how close to the shore it was, so we shot over to the adjacent (and vacant) camping spots to see where it was heading. 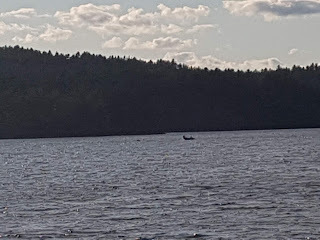 At that point, the moose turned and headed out to the open lake. We thought it was heading for one of the small islands in the middle of the lake, but it kept changing directions. We began to be a little concerned as it was moving further away from dry land and we thought it was in danger of getting tired and drowning. Julie got on her bike, and cycled to the main office where she told Wayne (the owner) what was happening. He and his buddy took their motor boat out as soon as they could. Meanwhile, the moose was heading towards one of the smaller islands. It seemed to get close to the shore, and then turned around and swam out into the open water again. Whereas we had gotten to see its shoulders as well at its head when it passed close by, we could only see its head, and we became even more concerned. It was quite the distance from us, as you can see by this photo we took. We watched as the boat neared the moose, and attempted to steer it towards the nearest island so that it could recover for a while. 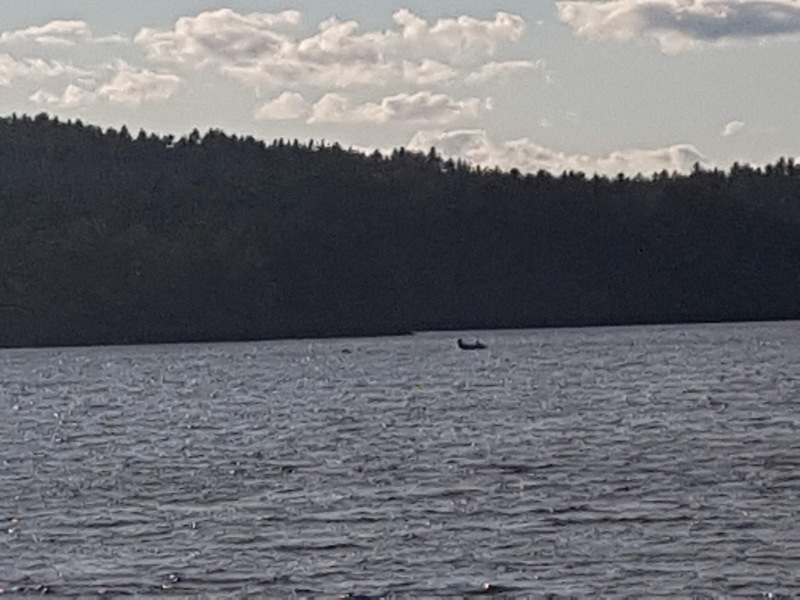 Gradually, it neared the island, and we saw it step out of the water and onto dry land... but then it dove back into the lake and began swimming again! Three others had joined us and we were all keeping our fingers crossed and holding our breath with the hope that its head would not disappear beneath the waves. Wayne was steering the boat to intercept the pathway the moose was taking, and to guide it to the next island. Once again, with bated breath, we watched as it approached the island, but swam right past it! By this time, we figured it had been swimming for at least 30 minutes and we weren't too sure if it was going to make it or not. However, it was now swimming with the flow of the lake and finally made it to the main land across the bay. We watched, with relief, as it climbed fully out of the water, and ran across the lawn of one of the lakeside cottages, and into the forest beyond. We couldn't believe how much energy this animal had, and what a strong swimmer it was. Everyone cheered and clapped, knowing that it was safe, and we gave a thumbs up to Wayne and his buddy as they passed us by. We were all excited to have witnessed the whole incident - especially as it had a happy ending! Retire to Elliot Lake? Why not?